I’ve been holding out on buying fabric for my next quilt (let’s not talk about the fact that my first one is still just a quilt top) until we found out if we are expecting a boy or a girl. Now that the mystery is over, I did a little fabric shopping today. Earlier this week, I found a baby quilts book at the library (Sweet and Simple Baby Quilts) and picked out a great pattern. This is what it looks like in the book. 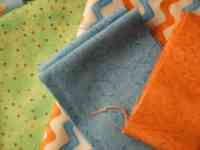 I really like the bug fabric and that will be the fabric for the center squares of all of the blocks. I cut all of the pieces this afternoon and hope to start the sewing this week, but it may not be until the weekend, depending on my energy level when I get home and on the fact that there will be some work in preparing for the husband’s birthday on Thursday. 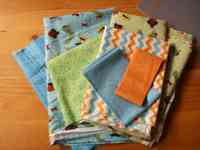 Hopefully, you’ll see finished blocks of the baby bug quilt coming soon! That looks hard, but it will be amazing! Love that fabric. 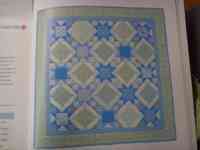 Cute quilt and great fabric choices! Adorable and congratulations on your baby boy! Wow. An actual quilt, and a stunningly cute one at that. Such a lucky little beastie you have there. great fabric choices, dude, i’m excited to see this come together!